This year remember to read out winter driving tips to stay safe. Fog or heavy rain are some the most dangerous weather conditions to drive in, with accidents likely to occur if motorists are driving too close together with limited visibility and reduced control of their vehicles. In extreme weather, it is recommended that you delay your journey if it is foggy or raining heavily. However, sometimes driving is unavoidable, so follow our winter driving tips below to ensure you stay safe when driving in fog or heavy rain. Planning your journey in advance will allow you to focus fully on the road, without dealing with dangerous distractions such as sat navs or confusing road signs. Check traffic reports before you leave for any news of accidents or severe traffic to avoid, and allow plenty of time for your journey so you can travel slowly and safely to your destination. With the reduced visibility fog can cause, and the lack of control a lot of water on the road brings, it is essential that you reduce your speed when driving in extreme weather conditions. Slower speeds will provide you with a larger stopping distance, more control, and more time to react to cars ahead of you. 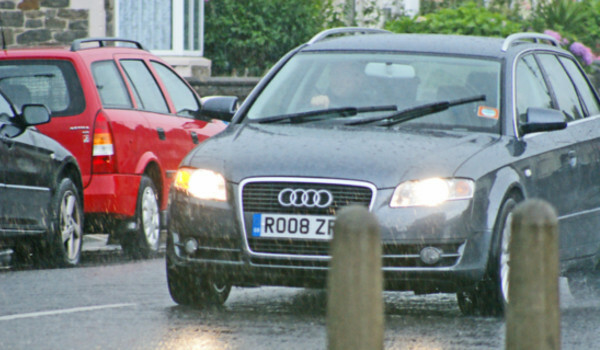 Ideally, you should remain at least two seconds behind any vehicle in front of you when driving to maintain a safe distance, but in heavy rain, you will need to keep almost twice your normal braking distance. Ensure that you follow this, or allow even more space, to provide you with plenty of time to stop or slow down should something happen to the vehicles ahead of you. It’s important to ensure that you know how to operate the fog lights on your vehicle before setting off, allowing you to easily switch them on when required. The switch placement will differ from vehicle to vehicle, so check the car’s manual – especially if you are using a hired vehicle – before setting off. Do not confuse your fog lights will your ‘full-beam’ headlights when driving through fog or heavy rain, as this can increase the risk of an accident with an oncoming car. Keep headlights dipped for better visibility for all road users, using your fog lights additionally when necessary. When visibility is greatly reduced, winding your windows down and listening for the sound of oncoming traffic can be a useful aid at junctions and crossroads. In extreme conditions, you should stop at every junction until it is safe to move on, allowing you to guarantee that no oncoming cars will be in your path. Caversham Vehicle Hire provide a comprehensive vehicle hire service for the Reading and Newbury areas, offering a range of domestic use cars, as well as commercial vans for hire. Let us know how you feel about our winter driving tips! Contact us today for more information, or to obtain a quote for your vehicle hire requirements for this winter.